Update #1 – Meet the team! It’s been an exciting first 24 hours of the Kickstarter, and we’re thrilled that we’ve already got some people backing us. Thank you so much! One of the things we realized when we started is that we’re… well, we’re not famous. There is no Chris Avellone, Lord British, or Warren Specter on this team. We’re not rock stars of the game industry, and we’re not going to get that kind of “instant support and recognition” that these kinds of people will bring to a Kickstarter. Instead, what we actually are is a team of solid, hardworking veterans who have shipped over a hundred games between us. And we’d like to introduce ourselves. One thing that *is* pretty cool is that we’re a really international studio, and have been for the last decade. We have people working all around the world, predominantly in Southeast Asia. In fact, when you look at all of the Boomzap team combined, we are one of the largest independent employers of game developers in Malaysia, Indonesia and the Philippines! 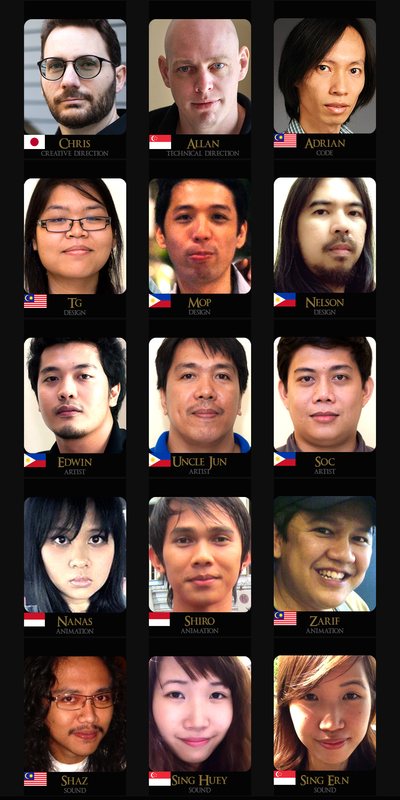 And within the Boomzap team, the Legends of Fire & Steel team includes some of our oldest and most experienced staff. Adrian, who leads the code development, is a 12 year veteran of the industry, and one of the most experienced game coders working in Malaysia. TG builds maps and designs the game from her home in Ipoh, supported by Mop and Nelson who are both working from Metro Manila. We also have Filipino artists Edwin, Uncle Jun, and Soc – who have over a dozen years of digital art experience between them. Animation and effects are being done by Nanas and Shiro in Indonesia, as well as Zarif in Malaysia. Music and sound is being made in Singapore by the Lee twins, led by Shaz in Malaysia, who has over 14 years of game audio experience. Leading the team are me (Chris) and Allan – the founders of the studio. We are both huge, huge strategy game fans (with a special love for Crusader Kings and Civilization). Allan has programmed and tech-directed dozens of games on PC, Mac, iOS, Wii, and Android over the last 15 years, and has taught at a number of game development programs in Singapore, as well as serving as the IGDA organizer there. I live in Yokohama and have been actively working as a designer, producer, and director in the game industry since 1992, with credits on almost 50 games, including producing the original Far Cry. We’re not famous, it’s true, but that makes us no less experienced. We are passionate, hardworking professionals who have been doing this a very, very long time, and are finally working on our dream game. We are committed to make Legends of Fire & Steel as awesome as possible, and we hope you’ll join us in this journey by funding our project and spreading the word!